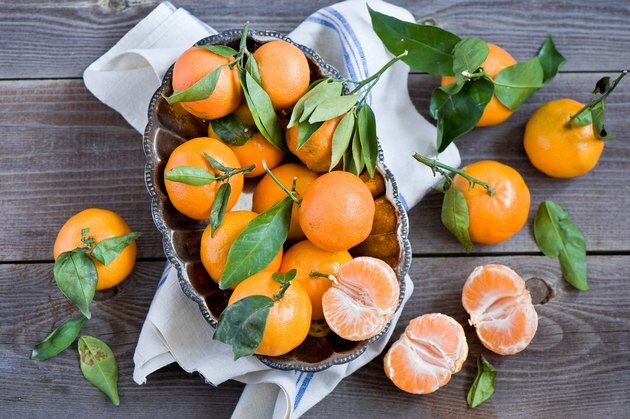 Are Oranges Good for a Cough & Phlegm? Oranges are healthy citrus fruits filled with vitamin C and other beneficial nutrients. They’re famous for being able to help treat malnutrition-related diseases like scurvy, which are caused by a deficiency in vitamin C. The vitamin C content of oranges is also thought to help with a variety of other conditions and can even influence respiratory issues. Oranges have beneficial nutrients, like vitamin C, that can help with respiratory conditions. However, this citrus fruit does not contain enough vitamin C to help with cold symptoms. Oranges are well-known for being rich in vitamin C. They’re also rich in vitamin A, minerals like calcium and iron, fiber and beneficial antioxidants. One of these antioxidants is citric acid, which is found naturally in a wide variety of foods, especially citrus fruits like grapefruits, lemons, limes and oranges. Citrus acid doesn’t just exist naturally — it can also be produced in powdered form and is commonly used as a component of cleaning products, cosmetics, food products and pharmaceuticals. Citric acid is known to induce coughing. This, in turn, means that oranges are good for coughing — quite literally, the citric acid in them can make you cough. By no means does this indicate that oranges cause colds, though. If you have a respiratory issue that has caused phlegm buildup in your body, foods that contain citric acid can be helpful. They can help you cough the phlegm out of your respiratory system, improving your symptoms. Of course, too much coughing will give you a hoarse throat, so be careful not to go overboard. Next time you pick up a glass of orange juice for a bad cough, you may want to think twice. Switching that glass of cold juice for a hot tea with orange and honey might be a lot better for your throat. Are Oranges Good for Colds? While the citric acid in oranges can make you cough, the vitamin C in this fruit might be able to prevent this and other symptoms of colds. In fact, large doses of vitamin C may help to reduce the incidence of colds. Unfortunately, this benefit isn’t applicable to everyone. Vitamin C in large doses has been shown to help prevent colds only in people who have been briefly exposed to cold environments or those who have performed strenuous exercise. What vitamin C can do, however, is <ahref="http: www.ncbi.nlm.nih.gov="" pubmed="" 15495002"=""> </ahref="http:>reduce the duration of your cold <ahref="http: www.ncbi.nlm.nih.gov="" pubmed="" 15495002"=""> </ahref="http:>and the severity of your symptoms. Keep in mind that oranges aren’t really likely to help much in decreasing how long your cold hangs on, though. Despite being a vitamin C-rich fruit, there are only about 90 milligrams of vitamin C in each orange. You’d need extremely high doses of about 8 grams of vitamin C for this nutrient to be clinically useful in treating your cold. Consuming adequate amounts of vitamin C means intakes between 75 to 120 milligrams (roughly the amount of vitamin C in one orange) each day. You can certainly give high doses of vitamin C a try, and they haven't been shown to be toxic. But be aware that doses like these are much higher than the standard recommended dietary allowance, so you should speak to your doctor before you try megadosing.